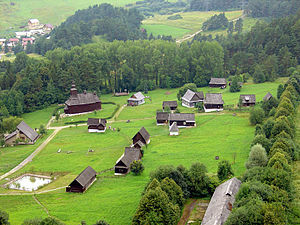 An open-air museum (or open air museum) is a museum that exhibits collections of buildings and artifacts out-of-doors. It is also frequently known as a museum of buildings or a folk museum. The concept of an open-air museum originated in Scandinavia in the late 19th century and spread widely. A comprehensive history of the open-air museum as an idea and institution can be found in Swedish museologist Sten Rentzhog's 2007 book Open Air Museums: The History and Future of a Visionary Idea. Living-history museums, including living-farm museums and living museums, are open-air museums where costumed interpreters portray period life in an earlier era. The interpreters act as if they are living in a different time and place and perform everyday household tasks, crafts, and occupations. The goal is to demonstrate older lifestyles and pursuits to modern audiences. Household tasks might include cooking on an open hearth, churning butter, spinning wool and weaving, and farming without modern equipment. Many living museums feature traditional craftsmen at work, such as a blacksmith, pewtersmith, silversmith, weaver, tanner, armorer, cooper, potter, miller, sawyer, cabinet-maker, woodcarver, printer, doctor, and general storekeeper. Open air is “the unconfined atmosphere…outside buildings…” In the loosest sense, an open-air museum is any institution that includes one or more buildings in its collections, including farm museums, historic house museums, and archaeological open-air museums. Mostly, 'open-air museum is applied to a museum that specializes in the collection and re-erection of multiple old buildings at large outdoor sites, usually in settings of recreated landscapes of the past, and often include living history. They may, therefore, be described as building museums. European open-air museums tended to be sited originally in regions where wooden architecture prevailed, as wooden structures may be translocated without substantial loss of authenticity. Common to all open-air museums, including the earliest ones of the 19th century, is the teaching of the history of everyday living by people from all segments of society. The idea of the open-air museum dates to the 1790s. The first proponent of the idea was the Swiss thinker Charles de Bonstetten, and was based on a visit to an exhibit of peasant costumes in the park of Frederiksborg Castle in Denmark. He believed that traditional peasant houses should be preserved against modernity, but failed to attract support for the idea. The first major steps towards the creation of open-air museums was taken in Norway in 1867, when a private citizen transferred some historic farm buildings to a site near Oslo (Christiania) for public viewing. This, in turn, inspired King Oscar II in 1881 to establish his own collection nearby, later inherited by the Norwegian Folk Museum. The similar Nordic Museum was founded in Stockholm, Sweden, soon afterwards. 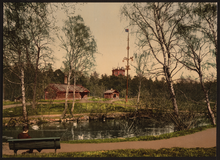 In 1891, the first major open-air museum was founded at Skansen, in Stockholm, as a part of the Nordic Museum. The Skansen museum included farm buildings from across Scandinavia, folk costumes, live animals, folk music, and demonstrations of folk crafts. The success of Skansen ensured that the open-air museum idea spread to countries across the world. Most open-air museums concentrate on rural culture. However, since the opening of the first town museum, The Old Town in Aarhus, Denmark, in 1914, town culture has also become a scope of open-air museums. In many cases, new town quarters are being constructed in existing rural culture museums. The North American open-air museum, more commonly called a living-history museum, had a different, slightly later origin than the European, and the visitor experience is different. The first was Henry Ford's Greenfield Village in Dearborn, Michigan (1928), where Ford intended his collection to be “a pocket edition of America”. :153 Colonial Williamsburg (opened in 1934), though, had a greater influence on museum development in North America. It influenced such projects through the continent as Mystic Seaport, Plimoth Plantation, and Fortress Louisbourg. The approach to interpretation tends to differentiate the North American from the European model. In Europe, the tendency is to usually focus on the buildings. In North America, many open-air museums include interpreters who dress in period costume and conduct period crafts and everyday work. :154 The living museum is, therefore, viewed as an attempt to recreate to the fullest extent conditions of a culture, natural environment, or historical period. The objective is immersion, using exhibits so that visitors can experience the specific culture, environment or historical period using the physical senses. Performance and historiographic practices at American living museums have been critiqued in the past several years by scholars in anthropology and theater for creating false senses of authenticity and accuracy, and for neglecting to bear witness to some of the darker aspects of the American past (e.g., slavery and other forms of injustice). Even before such critiques were published, sites such as Williamsburg and others had begun to add more interpretation of difficult history. ^ a b c d e f Hurt 1978, p. 368. ^ Hurt 1978, pp. 368-9. ^ a b Kenneth Hudson, Museums of Influence, Cambridge University Press, 1987. Hurt, R. Douglas (1978). "Agricultural Museums: A New Frontier for the Social Sciences". The History Teacher. 11 (3): 367–75. JSTOR 491627. Look up open-air museum in Wiktionary, the free dictionary. Wikimedia Commons has media related to Open air museums. European Open-air Museums An extensive list of Open-air museums in Europe. Open Air Museum Bokrijk Leading open-air museum of Belgium, Flanders. Hjerl Hede, an open-air museum in Denmark showing life from the early days until about 100 years ago. The Old Town (Den Gamle By), Aa open-air museum in Denmark showing urban life. Jamtli – One of Sweden's largest and oldest regional open-air museums, in Östersund.